My favorite part of birthday parties is birthday cake. I am someone who will eat leftover cake for days after the party too! Many of my avid readers may know that I started this blog as way to share lesson ideas and experiences I had as a fourth grade teacher celebrating children's author birthdays. Eventually, I worked my way through most the material I had, but I still loved the idea. Then came Kate McMullan's birthday last year and I decided to try Happy Birthday Author with my children. Her birthday was the perfect way to experiment because she was the author of my son's favorite book at the time, I Stink. I thought it would be cool to make an I Stink cake to celebrate (click here to view). This birthday celebration was the beginning of where my blog is today; celebrating awesome authors, reading as many of their books as we can, and extending the fun with my children through an activity. 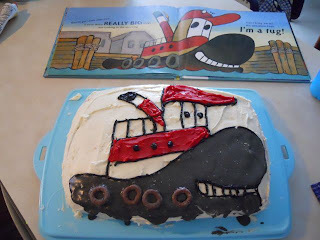 I asked my son if we were going to make another cake for Kate McMullan's birthday and he said with confident head nod, "I'm Mighty!" 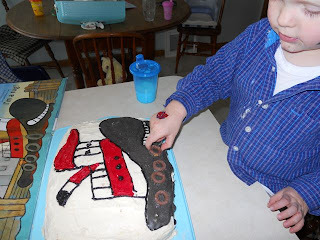 He and I were confident we could improve on last year's cake. As an added bonus, we got "Dad and son time" on this activity as nap times for the baby were well planned, and a surprise play date for his sister cleared the afternoon for us to work hard together on this project. 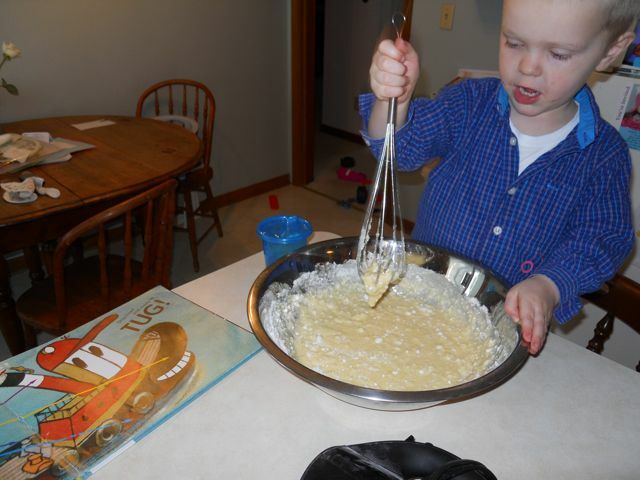 We baked the cake and read the book, then decorated and read the book again. My son had a running dialogue with himself all day and I heard him say many times, "Tug.Tug.Tug." or "Yo! Moby Dee!" 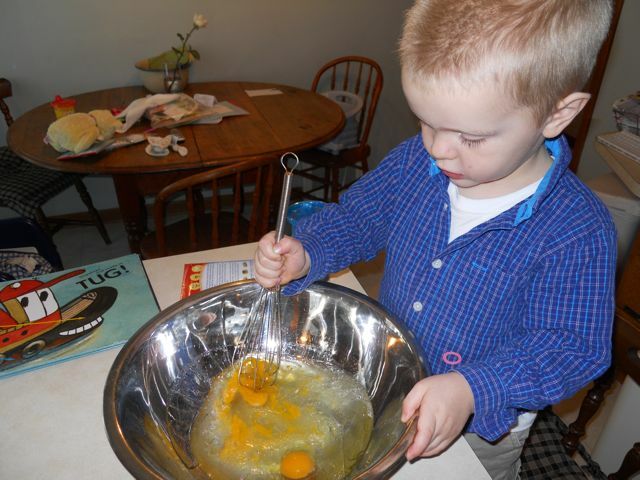 My son is a very big helper in the kitchen - whisking and mixing are his favorite jobs! We baked the cake shortly after breakfast to give it time to cool. We did make a trip to the store to buy red and black icing in a tube. Chocolate covered pretzels were used for the tires on the side of the tugboat. 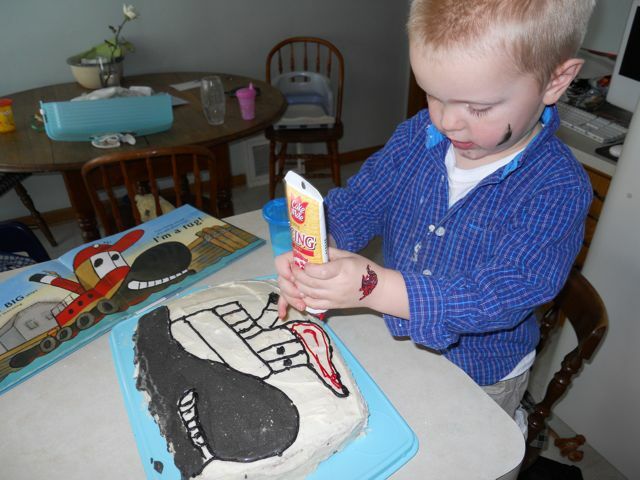 Our cake decorating skills have definitely improved since last year. He was so excited with our finished product. I Stink and I'm Mighty turned into a series with the addition of I'm Dirty, I'm Bad, and I'm Big. All of these book feature the first person monologue format with the main character inviting us along on a typical day. According to Just One More Book, Kate and Jim McMullan spent lots of time learning the machines (day trips on a tugboat in Boston Harbor, spending the day with backhoe operator taking out a tree stump, becoming friends with local garbage men) for the first three books which allowed them to create the hook that catches so many young readers. Jim McMullan said that Kate writes the books in a way that, "makes the kid feel like they are on the inside track because they know the words that the guys that operate the vehicle use." 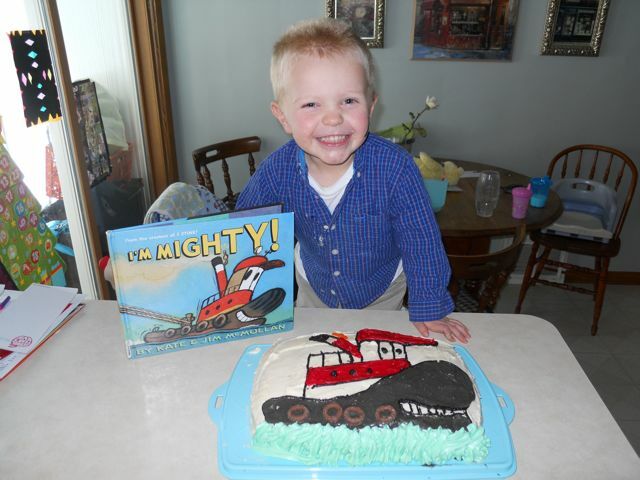 In my research, I was happy to find out that in the works is the next book in the series, I'm Fast featuring a train. Kate has posted photos of the "work in progress" on her Facebook Page. Every year on my birthday in January, two good friends take me out to lunch. One friend is Carol Carson, who designs beautiful book jackets. The other is Jean Marzollo, who's written hundreds of terrific books for kids, including the I Spy Series. On Jean's birthday in June, Carol and I take her to lunch. And on Carol's birthday in November, Jean and I take her. No matter whose birthday it is, Carol always picks the restaurant. We always bring 'party favors' instead of presents. We alway talk about books. And we're almost always the last lunchers to leave the restaurant. but luckily, you don't get three times older. Kate, THANK YOU so much for sharing your birthday memory. My family hopes you have a wonderful birthday! Your books have made a big impact on our family for many years and will continue for many more as we just started reading our first Dragon Slayer's Academy book! In closing, I always seem to have the desire to write more and more, but I recently had a teacher tell me that my posts are sometimes 14 pages when they are printed! (I really try to be concise!) So, instead of writing another 2 paragraphs I am just going to recommend that you read these other Kate McMullan books: Noel the First and Papa's Song . 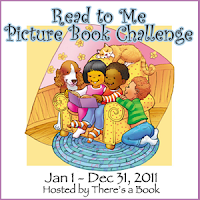 These books were two that we added to our list for the Picture Book Challenge sponsored by There's a Book! I love that cake! Such a cool idea! Love your blog too.